My cat Mochi. He’s almost as reliable as an alarm clock, but a million times cuter. He likes to sit next to the bed and make little chirping noises until I wake up. And if I don’t wake up when he wants me to, he jumps into bed and politely taps me on the arm until I do. 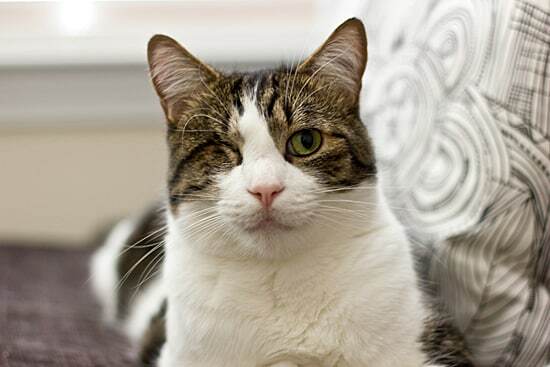 And really, it’s hard to get mad at him–I mean, he’s a one-eyed cat! And he chirps like a bird! But you know what else wakes me up in the morning? A good breakfast. When I have a delicious breakfast ready and waiting for me in the morning, it’s easier to get up than on those days when I know the only thing on the menu is cold cereal. (Maybe that’s why I’ve been making so many breakfast recipes lately?) 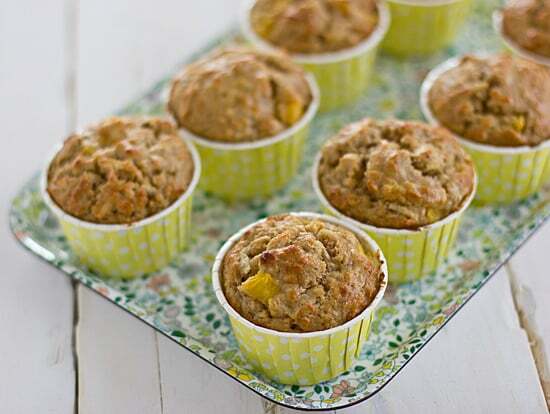 And these Mango Coconut Muffins are just that kind of wake-you-up-in-the-morning breakfast. With the coconut and sweet, ripe mango, these muffins taste like a treat, but the Greek yogurt and oats help you start your day off right. I made a batch of these over the weekend, froze them, and heated them in the microwave in the morning, until they were piping hot. Hello breakfast! 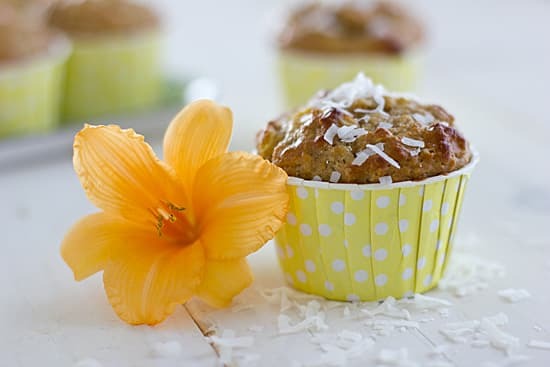 With the addition of coconut and fresh mango, this nutritious breakfast muffin almost tastes like a dessert. Preheat oven to 400 degrees. Spray a muffin pan with cooking spray or fill with paper liners. In a medium bowl, stir together oats, coconut, yogurt, banana, oil, egg, and vanilla extract. Pour wet mixture into the flour mixture. Stir until moistened–do not over-mix! Fold in mango. Divide mixture evenly into muffin cups. Bake for 17-20 minutes or until toothpick inserted into the center of a muffin comes out clean. I am so going to try this- I love both mango and coconut. Mochi is so cute! I had a question, do I need a mixer for the wet ingredients or just stirring do? Thanks. I made these and put them in big muffin tins, and left them in longer (10 mins) the tops burned and the insides were not done. I like bigger muffins, do you have any suggestions as to what I should do? I am making these again tonight. They are bomb! Great recipe. I use all whole wheat flour and reduce sugar to 1/2 cup. Delish!